← What Types Of Things Do Animal Activists Work For? 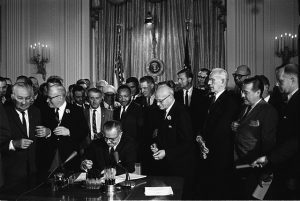 The landmark piece of legislation in the fight for civil rights was the Civil Rights Act of 1964. Enacted in 1964, this act outlawed discrimination based on color, race, or national origin. It prohibited racial segregation in public schools, protected voter’s registration rights and prohibited separation based on discrimination in all public places. When the Act was first passed, the government did not provide very strong enforcement authority. This was supplemented and strengthened over the next several years. Congress used its authority under various parts of the Constitution as the foundation for the legislation. These authorities were principally its duty under the Fourteenth Amendment to protect all citizens equally under the laws, its power under Article One to regulate interstate commerce and the duty under the Fifteenth Amendment to protect voting rights. The Act was signed by President Lyndon B. Johnson in July of 1964. The Civil Rights Act was the result of many years of activist lobbying for comprehensive protection of civil rights. The legislation was first sent to Congress in 1963 by President John F. Kennedy, but as a result of stalling tactics by certain Southern segregationist, Senators was delayed in the Judiciary Committee. Following the assassination of President Kennedy, President Johnson made it his priority to get this legislation passed. The legislation included provisions that barred segregation and discrimination in public facilities, education, housing, and jobs. The Equal Employment Opportunity Commission was also created by the legislation. This commission’s goal was to ensure fair hiring practices. It also established the Comunity Relations Service, a federal organization focused on helping local communities as they dealt with civil rights issues. The U.S. Office of Education was also authorized to provide financial aid to communities as they moved to desegregate public schools. There was significant resistance to the implementation of the Act. There were strong emotions on both sides and George Wallace, the Governor of Alabama ran for President of the United States on an anti-integration campaign and actually did well in the presidential primaries of 1964 in Wisconsin, Indiana, and Maryland. Initially, there was some confusion as to whether or not the legislation applied to the private sector. In the beginning, some public venues tried to turn into private clubs instead of being forced to integrate. Eventually, the Supreme Court declared these types of actions a violation of the law. This determination upheld the constitutionality of the Civil Rights Act and its equal access provisions.